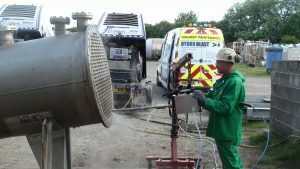 Hydroblast were recently tasked with unblocking a heat exchanger using the Peinemann. Like is the case with most pieces of equipment, heat exchangers can become blocked and not fit for purpose. The client was located in the North East of England, and buys and deals with used processing plant equipment, refurbishing them for sale. However, the client had received the heat exchanged in a state that made it only suitable for scrap. It was clear than the tubes required cleaning out to restore its efficiency. 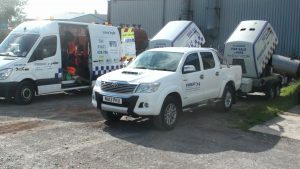 Hydroblast arrived on site with all the relevant equipment, and all that was required from the customer was a water supply and a safe area to conduct the work. To carry out the job, Hydroblast used nothing but some water and clever machinery. The chosen machine was The Peinemann Single Lance Tube Cleaner XL (XLTC), operating a flexible lance and spinning Banshee nozzle, as well as an Ultra-High Pressure Pump operating at 2500bar, 20 litres per minute. The flexible lance was fed into the tubes on the heat exchanger using an air-driven tractor (The Peinemann). This meant that the operator didn’t have to touch the flexi lance, making the work a lot safer. The special nozzle that was first used was an unblocker. This was followed by a tube polishing nozzle. 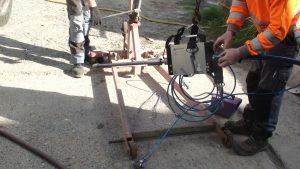 This remote single lance was placed to work by the operator, ensuring that the tube cleaning was safe and easy. When in use, the machine is fitted with ‘back out prevention’ equipment. This means that, should the flexi lance and nozzle come up against a blockage, it prevents hydraulicing. This is when the lance is pushed out when it comes against a blockage, forcing the nozzle and flexi lance out at a speed that could harm the operator. The operator on hand had his hands on the on/off ‘throttle’ of the tractor unit, and his foot on the on/off pedal of the pump. This makes thw process a lot safer for the operator, when compared with conventional tube or pipe cleaning. The process of cleaning the blocked heat exchanger, consisting of 300+ tubes, was finished in a 6-hour shift. The client ended up with a reconditioned heat exchanger that was fit for sale and able to work at maximum efficiency. The client was then able to sell the Heat Exchanger knowing that it was fit for purpose. Repurposing the heat exchanger saved the client time and money, and the purchaser was able to use a reconditioned machine, saving capital investment. It’s safe to say that we had a very happy customer! 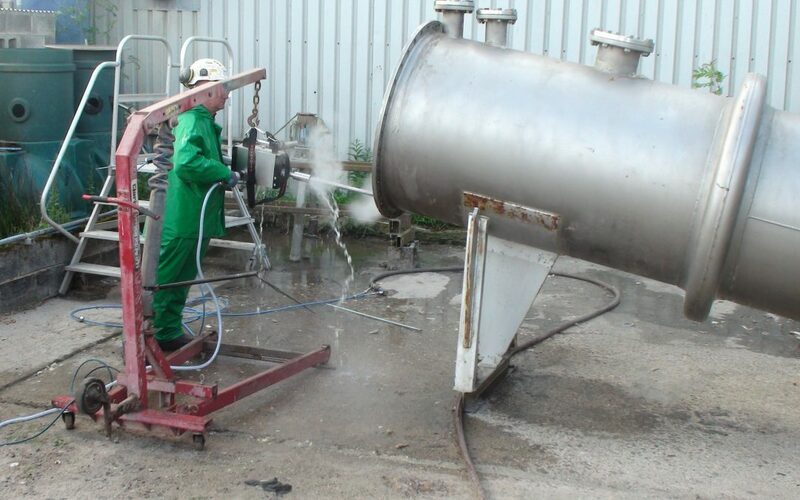 If you have a heat exchanger or industrial pipe that is blocked and needs cleaning, water jets are the man for the job. Get in touch with us today to use our expertise and specialist equipment.